This is the third post in a three part trip report of my big move to Doha, Qatar. If you’re new to trip reports you may find these boring as I did at first, but now I quite enjoy them. In other words, I’m going to keep writing them, so get used to it. If you find yourself falling asleep reading them, just scroll through them really fast to look at the pretty pictures. A five and a half hour international layover is kind of a rough spot to be in. It’s quite a long time to spend in an airport, but, depending on the airport, it’s probably not enough time to get out and do something fun. Prior to my trip, I looked into this situation to determine if Frankfurt happened to me one of those airports where I could run out to see the city for a bit before jumping on the plane to Doha. No such luck. It sounded like I’d need a layover of about eight hours or so to make something worthwhile happen. However, in the course of my research I found out that they have airport tours that last either 45 or 90 minutes depending on which one you choose. I like airplanes, and, while five and a half hours is a long time to spend in one, I do like airports as well. It sounded like a brilliant option until I found out the tours were only given in German. What kind of crazy place only offers tours in their own native language? Ridiculous, I know. While I would very much enjoy “breathtaking views of the Airbus A380”, I didn’t feel like the other 88 minutes of having no idea what was going on would be worth it. So it was onto my backup plan. When I finally found it, I didn’t like what I saw. Stairs. There probably was an elevator around somewhere, but in my jet lagged state I didn’t see one. I dragged my roller bag and backpack up the stairs and into the lounge. Once inside, though, it was worth the climb. I was happy to discover it did have a shower as I had hoped, and plenty of food options. I headed directly to the showers and found them full. An attendant gave me a pager (like one you’d get at Applebee’s), and told me to come back when it went off. I went to check out the food spread, and to grab a drink. I feel like I’m a little bit of an adventurous guy so I went for an Aperol Spritz, having no idea what that was. I did know it was orange, though, and I like orange. It came in a bottle, so it seemed kinda fancy, so it should have been a winner. It was not. No good. So, I decided to go back to my comfort zone and grab a Coke while I waited for the shower to become available. Don’t judge a book by it’s cover. Or a drink by it’s bottle. Eventually my pager went off, and I returned to the shower rooms. The shower room was quite simple but it had everything I needed to wake up a bit after a long flight. A quick shower really did help to wash away a good portion of the jet lag. With the shower out of the way, I had a solid 4 hours left to kill in the lounge. I quickly realized that in my infinite planning I didn’t even consider bringing along travel adapters to charge up the laptop and phone during the layover. I knew I’d have to get adapters for Doha once I arrived, but didn’t think about my time in Frankfurt. I had kept my phone plugged in for most of the flight from CLT-FRA, but the laptop was dying. I didn’t really need the laptop, but it would have been nicer wasting away 4 hours surfing the internet on a 14″ screen rather than a 4″ screen. I made do, though. I’m just glad I had kept the phone charged. As expected, the lounge was full of drink and snack options, but nothing especially great. I did find it quite funny that in the land of Bratwursts, they were featuring American hot dogs as the Daily Special. Don’t get me wrong, I love me some hot dogs, but it just doesn’t scream lounge food. I mainly stuck with some basic snacks, and the pudding was really, really good. I found it odd that this lounge supplied gummy bears. The Swissair lounge Dawn and I visited last year also served them. It just seems like an odd candy to provide. The fact that both airlines are from German speaking countries along with my recollection that the Disney cartoon series Gummi Bears was set in a German forest (though a quick Google search could not confirm nor deny that) made me wonder if gummy bears were, in fact, a German invention. It turns out they are German. You all may have already known this, but it was news to me. Kiwi on wild berry pudding. Delicious. Gummy bears now really make me want to watch the entire Gummi Bears series. I loved that show. As you can see, plenty of options to partake in, but I wasn’t all that hungry, and plus I wanted to to be hungry for the Qatar Airways flight. I mainly snacked and wandered around the lounge. Even with the long layover, the combination of jet lag and the hike to find the first lounge kept me from venturing off to look for others. The one lounge certainly had enough to keep one busy. They had racks of newspapers and magazines to read, a kids play area, and even a nap room that I didn’t find until I was on my way out. That’s something I would have liked to have found earlier. Do people still read from paper? The alligator shadow puppet indicates the nap room. Eventually my time in the lounge was up, and it was time to experience the “World’s 5-Star Airline”. With a slogan like that, you better be good. Truth be told, there are actually seven (7) five star airlines, but the other six are all Asian carriers. Qatar Airways is the only one who decided to be as so bold as to use that as their slogan. The only American airlines that are even four stars are Jet Blue and Virgin America. However, I do question the accuracy of the rating system when Allegiant Air gets three stars just like United and American Airlines. Allegiant Air is not fun to fly. Super cheap, but no fun. As I mentioned previously, I would have loved to get the nonstop DC to Doha or Houston to Doha flights on Qatar Airways, but they were too expensive. I was glad that at least one of the legs of my trip would be on Qatar’s flagship airline. One thing that I’ve learned since being here is that Qatar has a lot of money, and they like to show off. Qatar Airways is a huge marketing tool for the country of Qatar (as is the country’s nonprofit organization – Qatar Foundation). I boarded the plane and took my seat. I was immediately greeted by name, and offered a pre-departure beverage. I took up the flight attendant’s suggestion of lime juice, and it was so good that I ordered it with my meal later as well. The seat was top notch as expected. I was in seat 10A on an A330-300, and so I was in my own little mini business class cabin as you can see in the pic below. I was also lucky enough to not have anyone sitting in the seat next to me. First class was completely empty. To be honest, I didn’t realize it was first class until I started looking through my pictures and the seat maps of the plane. I thought that my flight only had business and economy seats (as I didn’t check the seatmap ahead of time). 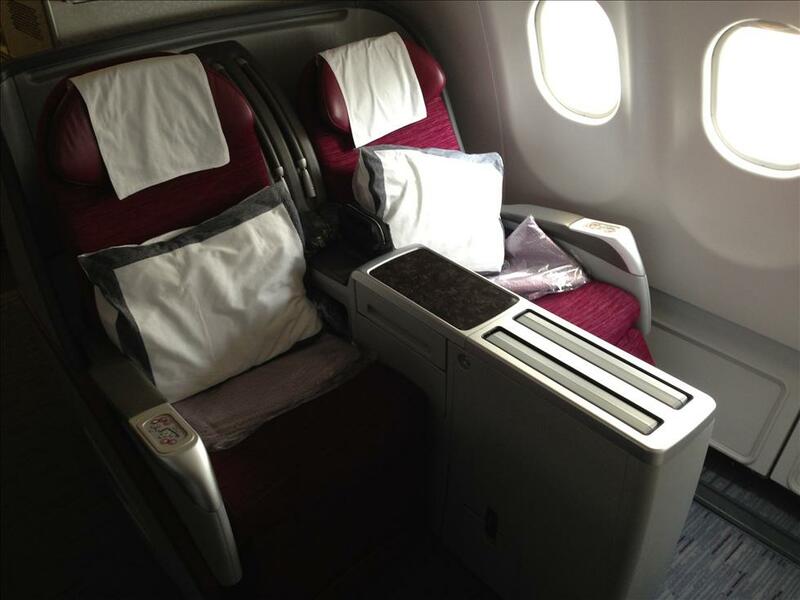 The first class seats did look slightly different after studying the pictures, but I didn’t notice it on the flight. From what I’ve read, typically the big difference between international first and international business class is the food and service, not the seat. As I said, the seat didn’t disappoint. It was fully lay flat as the US Airways Envoy seat was, but it did feel larger. I also prefer the seats to not be in the angled fish bone configuration, which probably leads to more space. It was quite comfortable for a couple hour afternoon nap. Besides the beautiful seats, another reason I was wanting to fly Qatar Airways was that I had read that you receive pajamas in business class. This is something that airlines typically reserve for international first class passengers, but being a 5 star airline, apparently Qatar Airlines wanted to step it up a notch. Yes, it’s a bit ridiculous for an airline to give out pajamas for a flight, but that’s what flying in a premium cabin is all about. Since my flight was during the day and it was only six hours long, I was a little concerned I wouldn’t end up with a set of Qatar Airways pajamas. Upon arriving at my seat I found both a Salvatore Ferragamo amenity kit and a small Qatar Airways branded cloth bag. The amenity kit seemed nice enough, and if I was familiar with expensive brands I’m sure I’d be impressed with whoever Ferragamo is. The kit included hand cream, lip balm, and cologne (an upgrade from the Envoy kit). The Salvatore Ferragamo amenity kit did seem to be lacking the typical toothbrush and toothpaste, socks, eye mask, and earplugs , though. For a second I held out a little hope they had somehow crammed pajamas into the small bag. Pajamas are thin and shouldn’t take up much volume at all, right? No such luck for me. No PJs in that bag. Turns out I’ll have to save my first in flight pajamas experience for another flight. The cloth bag held the aforementioned socks, eye mask, and earplugs as well as a travel hairbrush. Still no toothbrush and toothpaste, though. Turns out they keep the toothbrushes in the premium cabin bathrooms. They also even have shaving kits, but I figured I’d pass on trying those out. I can’t imagine using one of those disposable razors on my face on solid ground, let alone at 30,000 feet in the air when we could drop 50 to 100 feet at any moment due to turbulence. A nice gesture, though, and it couldn’t have cost them more than 50 cents to put that package together. Who couldn’t use an extra toothbrush? In case the amenity kit wasn’t enough or you prefer the Molton Brown brand over Salvatore Ferragamo, they provide hand lotion, soap, and cologne in the bathroom. All it was missing was the shower. And, yes, an airline does have a shower on a plane. And, yes, that is one of my aspirations in this travel game. I want to shower mid flight on a plane. Over the top? Yes, but, really, what about flying isn’t at least slightly over the top? One of the nice touches that I noticed about the whole plane was how everything had the Qatar Airways logo stamped on it – from the small dish they hand you with a warm wash cloth on it all the way to the seat belt. They’re proud of their logo and they put it everywhere. I’d be proud of it too, as it’s a pretty cool logo. It’s the Arabian Oryx which just so happens to be the national animal of Qatar. If they spent that much time on the details of the plane, you’d hope the food would be just as important to them. I hadn’t had much (maybe any?) Arabic food prior to this little jaunt, but I was excited to try it. The nasu miso was good, although I’m still not sure what that is. I chose the mezze for the appetizer and the lamb shank for the main course. I wasn’t used to Arabic food, but I did enjoy it quite a bit. I better get used to something other than pork. This time I was able to choose the dessert that came with 3 desserts – treacle tart, golden syrup ice cream with carmelized bananas – and that’s what I call a 5 star airline. In between each of the courses and throughout the flight the flight attendant was continually coming by to bring me more lime juice, tea, etc. or to ask if there was anything else she could do. The service was excellent, but I don’t have much else to compare it to. While eating dinner I took the opportunity to try out the in flight entertainment and catch up on another movie (Silver Linings Playbook). Nothing too special about the system, but because I was in my own little mini cabin with no seat in front of me the screen popped out from the console in between the seats. I actually prefer the screen in the back of the seat in front of me as that’s just one less thing I need to take down if I want to get up to stretch my legs. After the movie, I took another nap, and before long we were landing in Doha. It was around 10:30 PM local time, and I had to start work early the next morning. I was exhausted, but quite happy to finally be at my final destination. It was a great flight experience, and it might have even been 5 star worthy. I’m looking forward to flying Qatar Airways again, but there’s a pretty good chance the next time them I’ll be in the back of the plane. It’ll most likely be my final flight home from this crazy adventure before I get to sit up front with the big kids again, but I can hope, right?